Up Up and Quantify.. – Arbitrary Musings.. 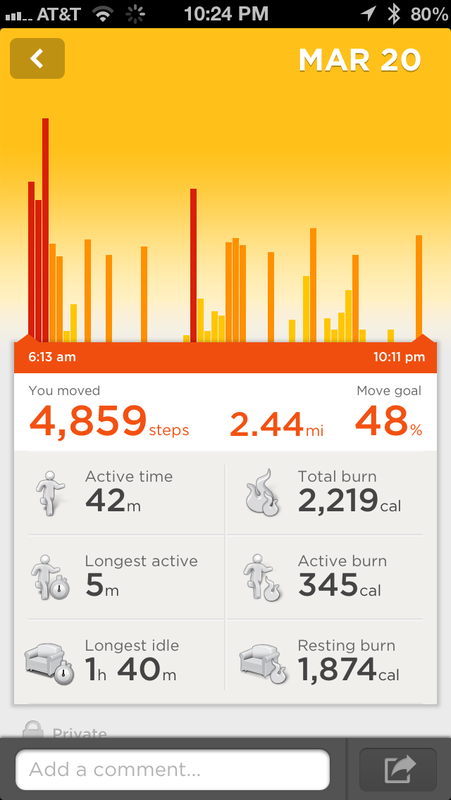 So I’ve recently purchased a JawBone Up band to see what all the fuss is about around this self quantifying movement. It retails for about 129$ and can be picked up at the Apple store or other fine retailers, like Amazon. It comes in some nice packaging as you would expect and in several colors and sizes. 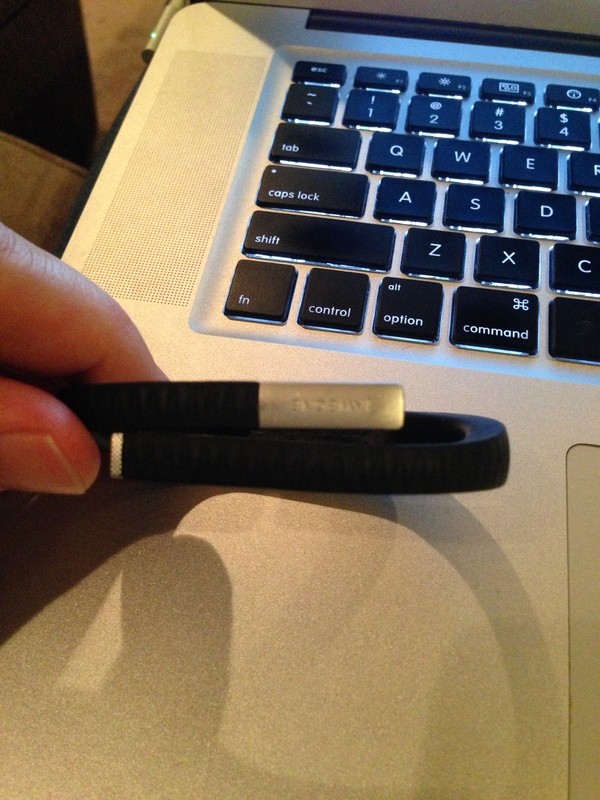 The colors are self explanatory but JawBone did something pretty cool for the sizing. They included a measurement flap on the packaging that allows you to check your size without having to open the package. Smart. I picked up the black/XL version. 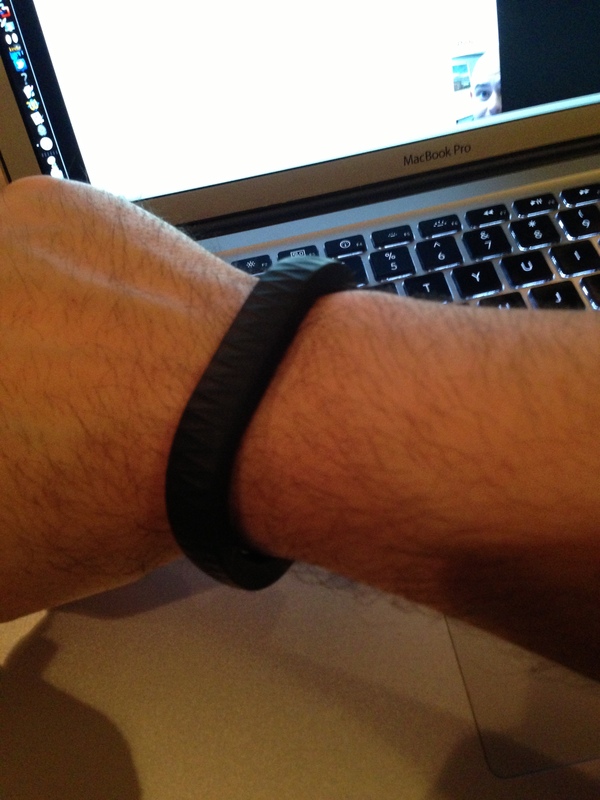 The band itself is quite light and hardly noticeable after a few minutes wearing it. It doesn’t have bluetooth syncing like some of its competitors and syncs with the iphone via the headphone port. Fitbit does offer Bluetooth syncing but isn’t available yet in a wrist band form factor. After using the Up band for several weeks and syncing it the recommended two times a day, the lack of Bluetooth syncing is probably my biggest con for the device. View of Up on my wrist. As you can see the XL version fits my wrist pretty well. I don’t have any worries that it will slip or fall off. Jawbone says that the bracelet can withstand thousands of showers but I have yet to put that particular claim to the test. I definitely wouldn’t wear it swimming, but it’s been splashed plenty during hand washing and doing dishes etc with no ill effects. So what’s the point of this device? To collect data and present it to you in a way that will allow you to use it to improve yourself. 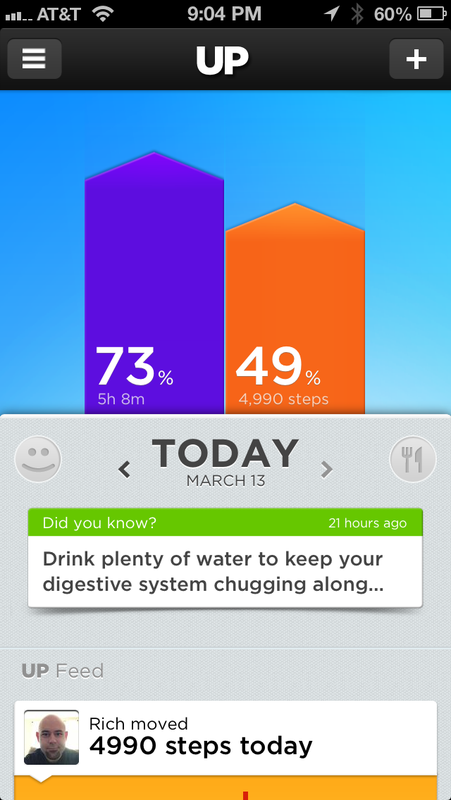 The two main items the app shows you is the sleep you get and the steps you’ve taken each day. You set up your goals in the app and it shows you where you stand in relation to them. You can then drill down into each and get a more in depth breakdown of that metric. In the breakdown you get things like Active Time, Total Burn, Longest Idle and Longest Active among others, which you can use to fine tune your daily activity. 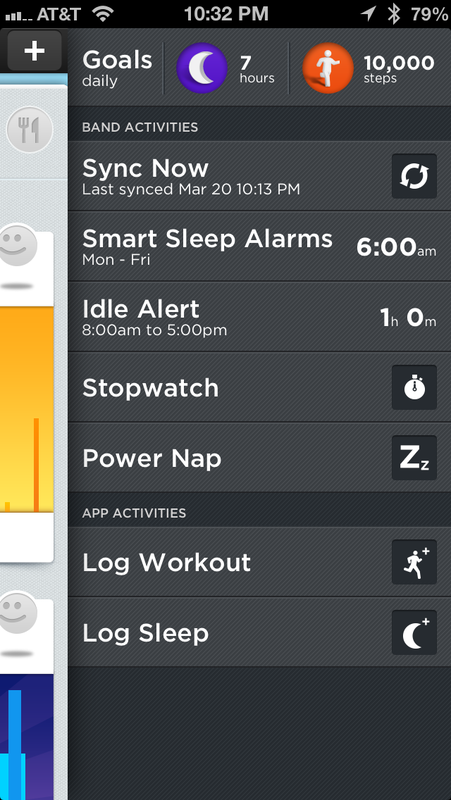 Other features, including some I find really useful are the Smart Sleep Alarms and the Idle Alert. The Smart Sleep Alarm is actually pretty fantastic. You set a time that you want to get up to start your day, and the “Smart” aspect is that the Up band will monitor your sleep and will wake you at the optimum time with a gentle vibration. The alarm won’t go off hours ahead of your desired time, you set a window that it will stay between. Mine is set to 30minutes. I have found it to be pretty dead on with the timing and really handy. Perhaps my favorite feature is the Idle Alert. I sit at a desk all day staring at SQL Server Management Studio and T-SQL code all day so I have frequently found myself sedentary for large stretches of the day. Needless to say, that isn’t very healthy or comfortable when finally getting up from one of those extended sessions. This is where the Idle Alert is clutch. It’s pretty self-explanatory but the Idle Alert will give you a gentle reminder to get up and move around after an amount of time that you set. I have it set at 1 hour. It’s a small thing, but I really love this feature. It gets me up and forces me to get some blood flow going and also helps me retain my focus on the task(s) I am trying to complete. It also tells me I should probably look at a standing or walking desk. Well, maybe one day. Other stuff you can do with the Up band. Some of the other things you can do is use the stopwatch function or the Power Nap function, which is pretty cool. Unlike many of us would like to think, the optimal nap isn’t 2 hours on the couch. It’s actually about 26 minutes and the Power Nap function helps you nap with ninja like efficiency. It will detect when you fall asleep and wake you when you will be most refreshed from your little siesta. You can also log any missed sleep or any work outs that you feel it may have missed. I’ve had my Up for about 6 weeks and I have to say, that while I don’t use it to it’s potential, I do find it immensely useful in my day to day activity. As I mentioned earlier, I have found that the lack of Bluetooth syncing is a bit of a buzzkill and I may consider the FitBit wrist band when it is released. But that is my biggest gripe, and totally a first world problem, so overall I am happy with the device but if wireless syncing is a must for you I would probably recommend waiting for the Fitbit Flex. This is a growing space and there are some other more advanced devices on the horizon from some other companies, but like in all tech, there is always something better around the corner. The Jawbone Up is a cool device and provides a lot of information and functionality for being an early entry into the market. I do look forward to the really amazing stuff we’ll see in future gadgets like this in the future but I’m definitely enjoying the Up now. Previous Previous post: Bzzz..What’s that? Oh, it’s my Pebble!